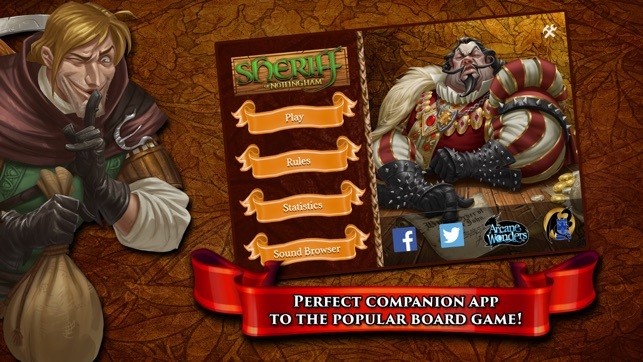 The Sheriff of Nottingham Companion App is the perfect addition to the wildly popular board game, Sheriff of Nottingham, from Arcane Wonders®! 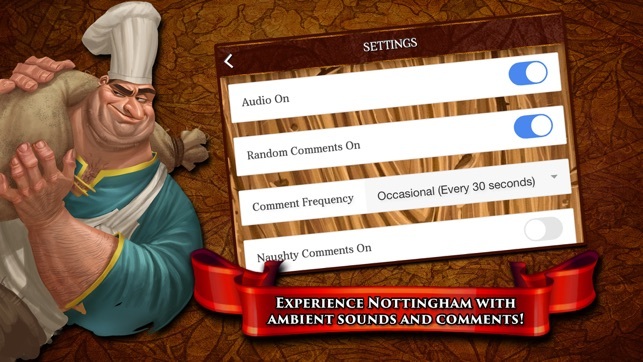 Whether you are looking to keep the Sheriff on task with a customizable timer, score your games more easily, or you’d simply like to experience Nottingham more deeply, with ambient sounds and comments, this app has it all for you! Keep score, customize the time of you rounds, and even unlock the “Merchant Fun Pack” for more hilarious commentary, clickable soundboards, and statistic tracking! 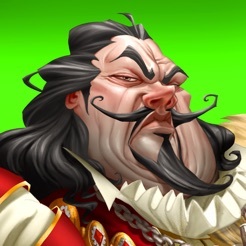 See more about Sheriff of Nottingham at www.arcanewonders.com today! - Added fancy new scoring breakdown after the end-game results. - Reordered the contraband items on the scoring page. - Fixed Pumpernickel bread's value. - Added "+60 Second" icon to the timer, in case you need more time. Special thanks to Jerek for ideas and feedback! I purchased the app in order to access the statistics. I think it's great that it can keep a running tally of wins and loses for players but I wish it would also show a break down of kings and queens. 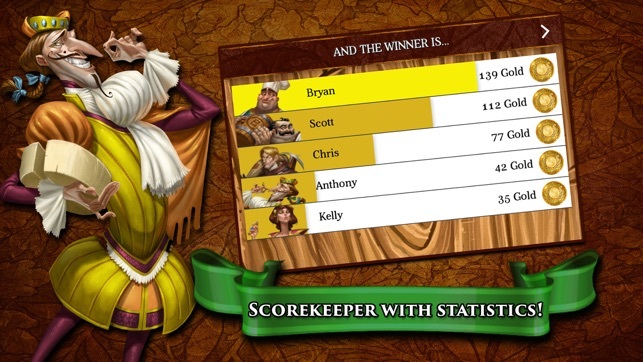 Another review stated that the app isn't actually adding the bonuses, I didn't notice that but I also suspect it isn't because in the last game I played, one person ended up with 80 as their final score and she had gotten the king of apples and queen for another good and her score seemed rather low for those bonuses if they were included. 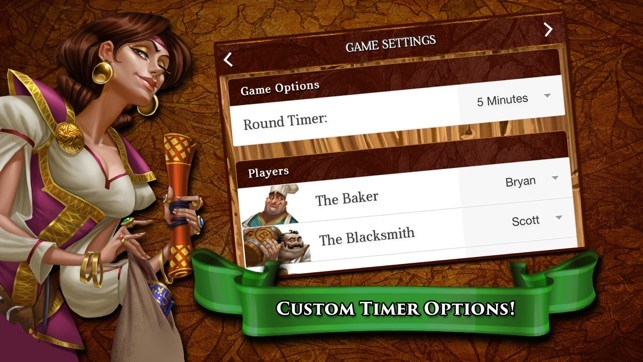 I also think a great added feature for the app would be a timer specific to each sheriff's inspection time, like the sheriff has 1 minute to decide to inspect a bag or let the player bribe the sheriff instead of the overall round timer on the app. Otherwise someone has to pay attention to the timer count down to see if it is approaching one minute for the inspection. The comments are funny though and it they work fine. This app is great for getting scores quickly too so that everyone doesn't have to whip out calculators to tally up their totals. This is a very helpful app for those who dislike or get board of counting up the final scores for everyone. The app also has a timer for inspections if you choose to play that way. This is a great app but there are definitely things that need to be changed, fixed, and improved. One problem I've been having is with the ambient sound. They seem to play fine until the begin the inspections clip is finished playing. The ambient sound just seems to cut off then. 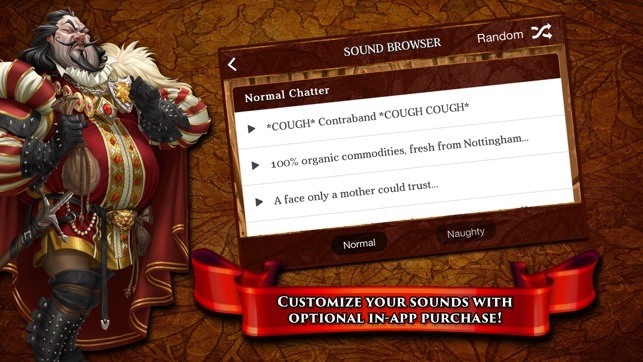 With the addition of the Merry Men expansion, I would expect the app to have updated to have the new features. I understand this process might take a while, but it seems like it should have been done by now. I don't know if many people are working on this app at all anymore, but these things seem like obvious fixes. Other performance and bug fixes mentioned by other reviewers would be very appreciated, but do not effect me that much. I downloaded this app in hopes it would make playing the game easier. The very first few times I opened the app, as well as closing it and reopening it multiple times (to make sure it wasn't a one time issue), it didn't work correctly. I could scroll through the pre selected options for adding players or changing the timer length, but I couldn't actually select anything. So essentially I was stuck there, with the pre selected scroll menu blocking everything else on my screen. This minor issue makes the entire app useless. If my explanation doesn't make sense, you'll just have to download the app to see what I mean. I have an iPhone 7 Plus, so it's not an older iPhone problem. 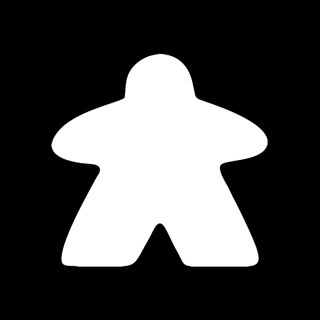 I love arcanes board game, so don't let this review deter you from buying the actual game. Just don't waste your time or space downloading this crappy app.